JUBA, Southern Sudan, Apr 6 2010 (IPS) - While there is a growing desire for change in Sudan – particularly among the younger urban population in the north – there is no atmosphere of heated campaigning or supporters mobbing candidates in the south, as campaigning for general elections concludes. The absence of excitement and an election mood is partly explained by the fact that many voters here questioned the choice of Yasir Arman, to represent the southern-dominated Sudan People’s Liberation Movement (SPLM) party as presidential candidate in the April 11-13 poll. Arman was one of the few Arabs to join the rebellion in the early years of the uprising, but party insiders say this advocate of a united Sudan – some remain within the SPLM – was troubled playing a role that could well see the disintegration of Africa’s largest country. He would of course have secured SPLM bloc votes in the south, while drawing a significant vote from a northern minority of liberal urban Muslims, but Arman is largely scorned and regarded as a traitor in the north for betraying the cause of Arab Muslims in the Sudan. The pressure on Arman proved overwhelming, and he withdrew from the race on Apr. 1, citing electoral irregularities and the continued conflict in Darfur. “(Arman) advocated for his withdrawal. We had tried to convince him for weeks not to do that but he insisted that he wanted it done that way,” Riek Machar, the SPLM vice president of the government of southern Sudan, told journalists in Juba, the capital of Southern Sudan. The National Congress Party (NCP) of Sudanese president Omar al-Bashir, which claims to protect the interests of Arab Muslims in the Sudan, has a different view. One of Bashir's other rivals, the former Prime Minister Sadiq al-Mahdi, head of the Ummah Party, had been seeking to postpone the elections until the conflict in Darfur is resolved - a move rejected by both the NCP and the SPLM, as well as by the U.S. State Department. Without votes from the Ummah party's traditional stronghold in the war-torn region, Mahdi’s chance of ruling the Sudan seems remote. Southerners have several reasons for opposing the postponement of the elections. Firstly, they recall how Mahdi and Mohamed Osman Mirghani, the leader of another northern party, the Democratic Unionist Party (DUP), rejected appeals to suspend the 1986 elections until the conflict in the south was resolved. 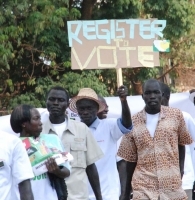 Secondly, southerners fear that the calls by northerners to postpone the elections are aimed at delaying, and eventually cancelling, the referendum on South Sudan’s independence on Jan. 9, 2011. Salva Kiir, the president of the government of southern Sudan, who is running to retain his post, has warned that the referendum must take place on time. “(Arman) has no chance. He has been misinformed about his chance to win the elections. Bashir will win,” Ibrahim Ahmed Omer, a senior NCP official, told the British Broadcasting Corporation (BBC) on Apr. 3. Opposition political parties say Bashir is desperate to cling to power by legitimising his mandate via internationally-monitored elections and thus to escape the International Criminal Court (ICC). “The election has been designed for one man, not for democratic transformation,” Arman told a news conference in Khartoum following the announcement of his withdrawal. He said the NCP was only holding these elections in order to “deflect” pressure from the ICC on its leader. The ICC, with its headquarters in the Dutch city of the Hague, indicted Bashir in 2008 for alleged human rights abuses and crimes against humanity in the troubled western region of Darfur. The conflict in Darfur erupted in 2003 after the rebels there took up arms to fight marginalisation. More than 300,000 people have been killed and over one million people displaced by the conflict since then. Bashir has denied the ICC allegations. Bashir also controls the state media – radio and television – and uses state funds and other resources such as helicopters and vehicles for his campaign. The majority of Sudan’s more than 80 opposition political parties have no access to such advantages. No one is talking about the possibility of a second round any longer with the SPLM candidate out of the way.